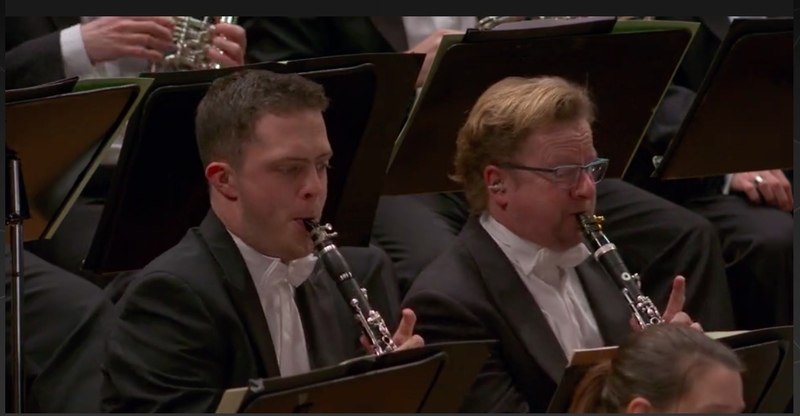 In today's Berlin webcast, Wenzel Fuchs was playing a set of clarinets with little white disks with something black in the middle on the top of the top joint. They looked a little like small peppermint lifesavers. Never seen these before. I assume they're maker's marks. Does anyone know who makes these instruments? To me it looked like a hole punch reinforcement label. I didn't know what to make of it. I thought of that, but, does anybody even use those anymore? Not sure this is relevant but I use something similar only on my A clarinet so I can immediately tell that I don't have my Bb in my hands. He plays Wurlitzers which have a circular logo, but it's not filled in to make it that obvious. This was about as conspicuous as you get. Bright white and raised a little above the wood, right next to the register vent. I think it was on both instruments because I saw both the Silverstein and the metal ligature, although the Alpensinfonie only has a Bb part. Do they have Wurlitzer Prestige instruments now? Or maybe it was a statement of some kind. Some Eastern people have jade rings as a sort of mystical thing. Is Wenzel a Taoist? Good to know I wasn't hallucinating. He sounded pretty great in that concert! The concert is now on Digital Concert Hall. I did see the "lifesaver" on the Fuchs' clarinet multiple times, but I was able to find one time when there WASN'T a "lifesaver" on his clarinet. Does anybody know what sort of earplugs he’s using? There are some C parts in the piece, although I don't know if the first part has any. Bb, C, D and Eb. That looks like a reinforcer stuck on there. Something like the LefreQue "sound bridge?" Perhaps David Blumberg could ask him for us? He (WMF) was asked: "Was bewirkt der weiße Kreis...?" He replied: " Nur ein Witz"
To prompt rounds of gossip and speculation from the clarinet faithful. Well played, Wenzel, well played. Helps that the Music Director has a sense of humor. Wonder if anyone tried something like that under Karajan.